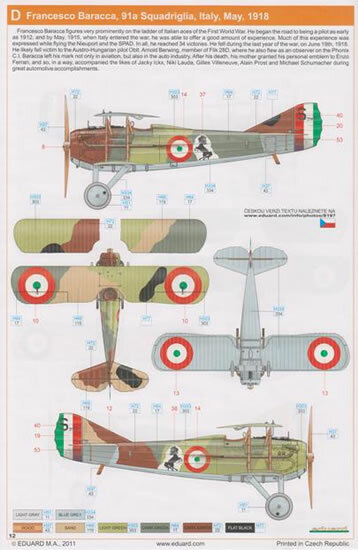 Contents and Media: Olive coloured plastic parts; colour and nickel-plated photo-etch; markings for five aircraft. 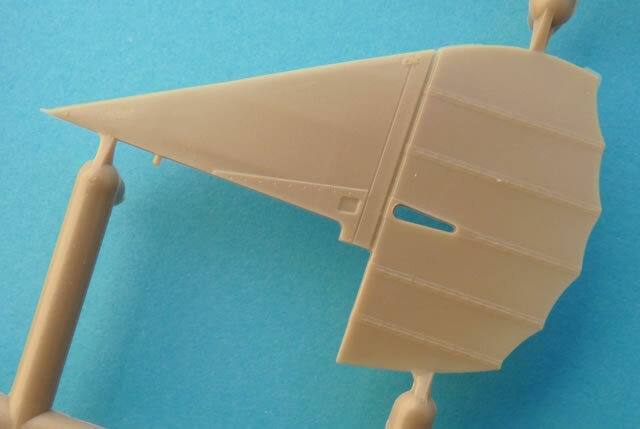 Superb overall detail; one piece wings with commendably thin trailing edges; nicely rendered fuselage stringers and rib tapes; excellent use photo etched parts; decals in perfect register with minimal thin carrier film. 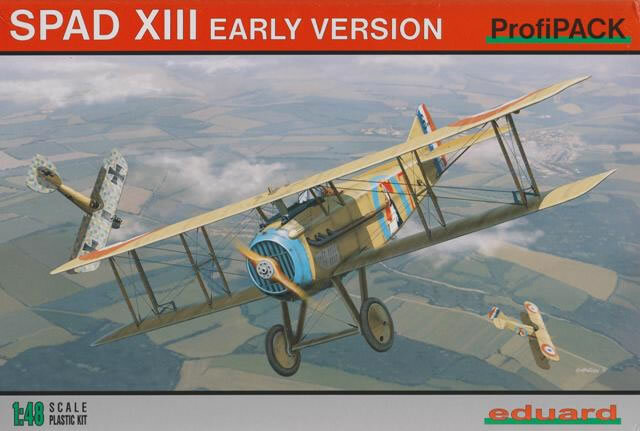 At last we have a worthy companion for Eduard’s late version of the SPAD 13. 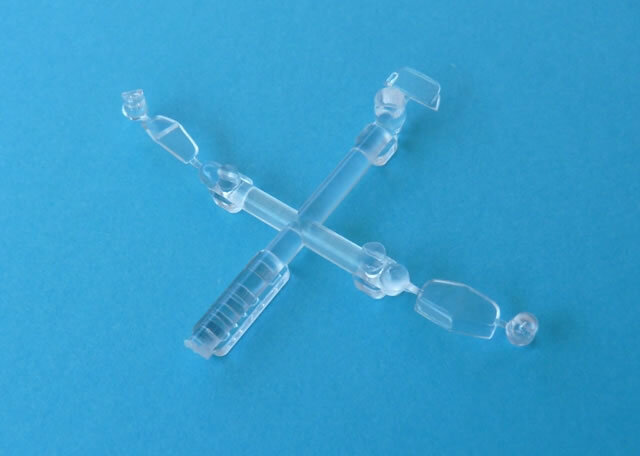 Thanks to the close relationship of the two kits, we get the same high quality of product we saw previously. 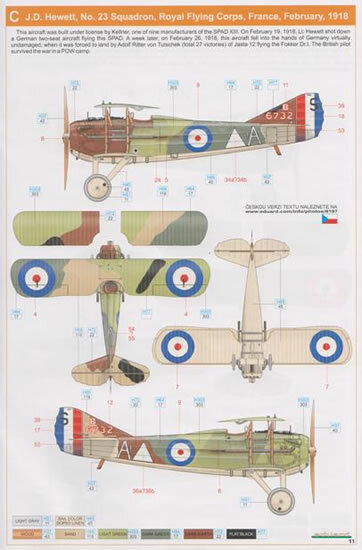 It’s a worthy addition to Eduard’s WWI aircraft range and one very much needed by First World War modellers. 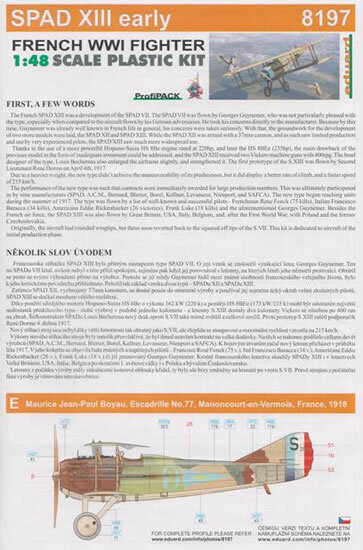 It has been a long time coming but Eduard’s “early” version of the SPAD 13 in 1:48 scale is finally with us. Their initial release of this iconic fighter was way back in 2008 which featured the squared off wingtips of the later series. It was an impressive kit at the time, having taken full advantage of the manufacturing techniques then in use. Now 3 years later we have its companion. Upon opening the box we are greeted by the familiar layout associated with a “ProfiPACK” kit. 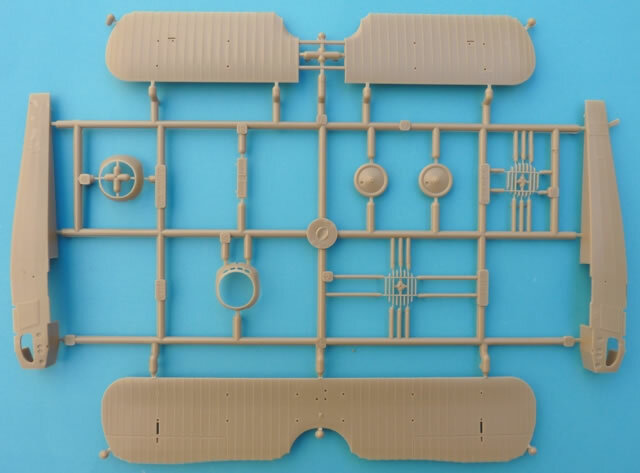 Inside are 3 sprues of tan coloured plastic (plus clear parts for the windscreen), a fret of coloured photo-etched items, express masks for painting, and a decal sheet for 5 aircraft. So what’s different between the two SPAD incarnations? Sprue “8195B” has been replaced by “8195A” for this boxing and results in the expected new wings as well as new fuselage halves. These latter items no longer carry the portside camera access hatch and also gone are the chute openings for the disintegrating ammunition belts. 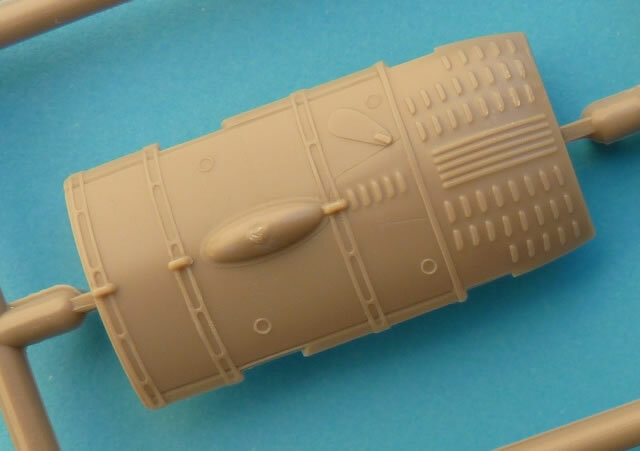 All 85 plastic parts were crisply moulded and any ejection pin or sink marks are hidden on the finished product. There are 29 items contained on the p-e fret and these useful additions display good colour registration and minimal attachment points. To judge the accuracy of the kit we turn to the general arrangement drawings found in Windsock Datafile 32. These respected 1992 plans were drawn by Doug Carrick and after cleaning up any flash, the kit parts match the outlines perfectly. 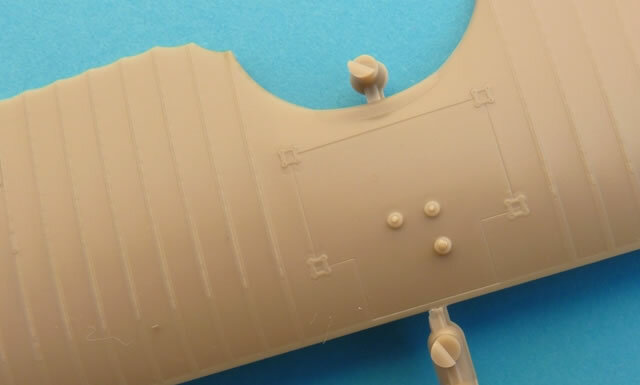 Even the smaller details are spot-on so the modeler is assured of an excellent starting point. As with any aircraft produced in significant numbers, there were many changes made along the way. 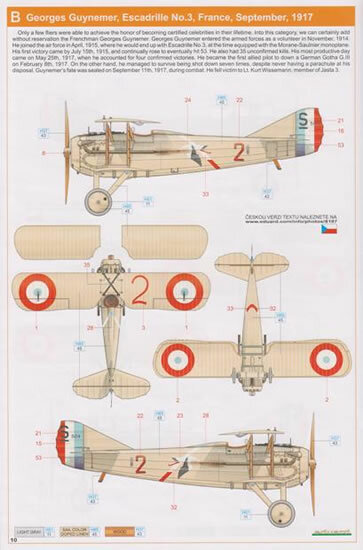 The SPAD 13 was manufactured by 9 different contactors so the modeller must be vigilant to keep in mind differences between such things as louver positions, wheel sizes and bell crank apertures…just to name a few. There are plenty of optional parts to help along the way. Eduard provide both single and two piece cowl arrangements, the 250 Éclair series 153 and Gremont propellers, and three styles of windscreen. The cockpit is where it all begins and Eduard has done a fine job of matching the items found on the Memorial Flight Association’s restored Kellner-built Spad 13. No less than 30 parts make up this area and that includes coloured photo etched items for the seat belts, instrument dials and even a map. 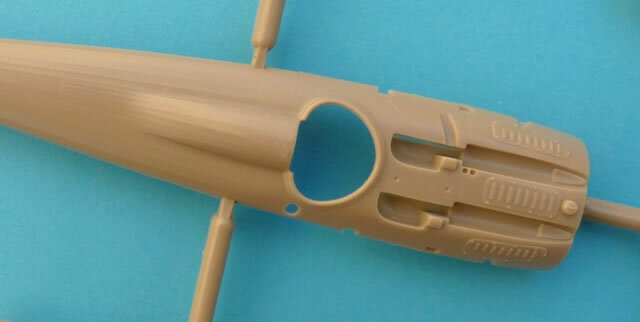 Also seen on the fret are gun sights, throttles, and best of all, the mesh side panels for the forward fuselage. The wings are also worthy of praise. Each has commendably thin trailing edges with no distortion whatsoever. We get a subtle representation of the stitching that shows through the rib tapes and the manufacturer has correctly shown the ply sheathing that appeared on the leading edge of the upper surfaces only. The unconventional splitting of the fuselage is another bonus. 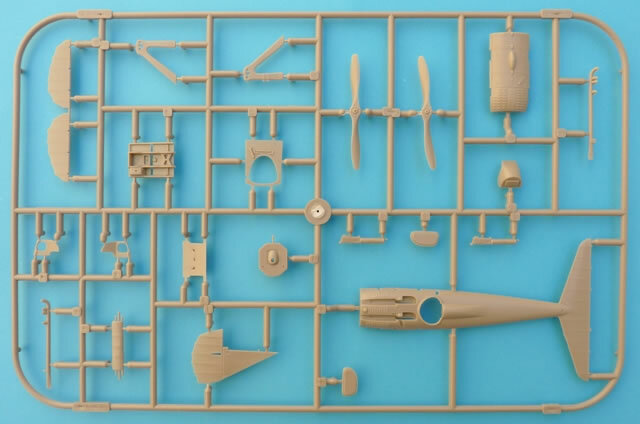 Eduard introduced this method of assembly to us with their 1:72 scale offering of the same subject. It allows the modeler to build this structure without destroying the finely rendered stringers. As mentioned previously, three choices of windscreen are supplied as well as a masking set. Not only does this sheet cater for the clear parts but it also helps deal with the tricky task of painting the wheels. Assembly was an issue on Eduard’s “late version” of the SPAD 13. It will be interesting to see if this kit assumes the same challenges. The new fuselage halves may come to the rescue but just in case here are a few things to watch out for. The upper deck may need thinning to make more room for the pilot’s “shelf”. 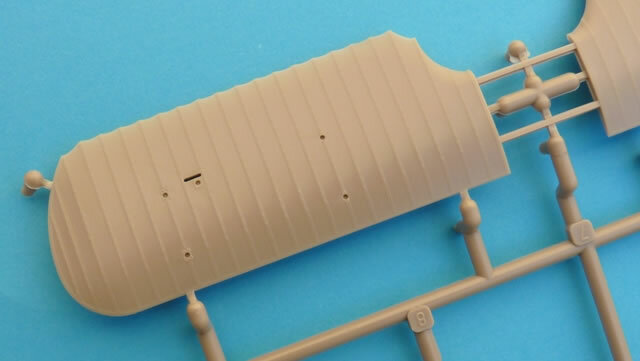 The fuselage halves could require extra coaxing to contain the interior and the older kit also needed a shim to allow the nose to fit squarely on the assembled fuselage. Fortunately these were minor annoyances rather than major problems. The instruction booklet is well laid out, and it needs to be considering the wealth of parts. A rigging diagram is included which can used in conjunction with the box art if one feels the need for further clarification. 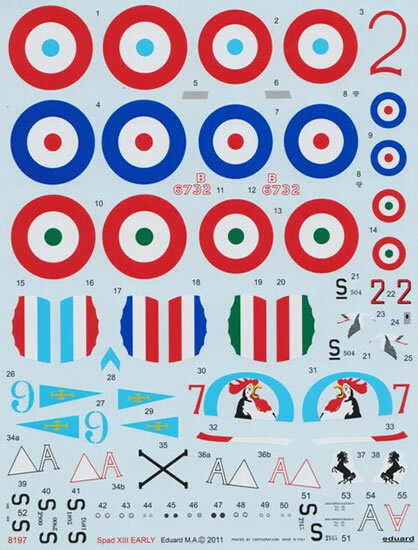 There are 5 aircraft to choose from and these are contained on a single well appointed decal sheet. As well as included stencil data there’s a compliment of instrument faces for those that wish to forgo the photo-etched option. All items are printed in perfect register and are surrounded by minimal carrier film. The famous crowing cockerel of SPA48 adorns the fuselage of Roques’ SPAD 13. He finished the war with 5 confirmed victories, amazingly all of his victims flying a different type of aircraft. He managed to survive both World Wars and died in May 1988. Guynemer died in combat having amassed an impressive 53 victories between July 1915 and August 1917. His most productive day was 25 May of that year which saw him down 4 enemy aircraft. There were also another 35 “probables” before he fell to the guns of Lt. Kurt Wiessman of Jasta 3. This license built Keller aircraft had quite an interesting career. Hewett piloted this aircraft to shoot down a German two-seater on 19 February 1918. A week later this machine was seen in German hands when Adolf Ritter von Tutschek (27 victories) of Jasta 12 brought it down intact while flying his Fokker Dr.I. 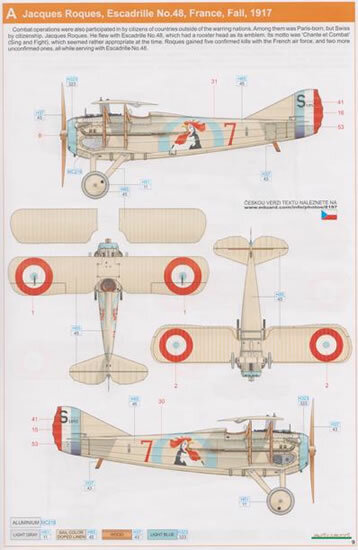 Baracca used a prancing horse as his personal emblem and this can be seen on the SPAD illustrated here. After Francesco’s death, his mother allowed Enzo Ferrari to use the symbol on his cars thus preserving her son’s memory long after his death. After scoring 34 victories he took off on a strafing mission on 19 June 1918 but never returned. His body was found 4 days later. Boyau was a 35 victory ace that specialized in downing balloons. No less than 20 were attributed to “gas bags” and on 3 separate occasions he managed to roast two “sausages” in one day. He was killed in action on 16 September 1918 when after destroying a Drachen of Bz 152 his flight was surprised by Fokker D.VIIs of Jasta 15 where Ltn. Georg von Hantelman happily added Boyau to his list of conquests. 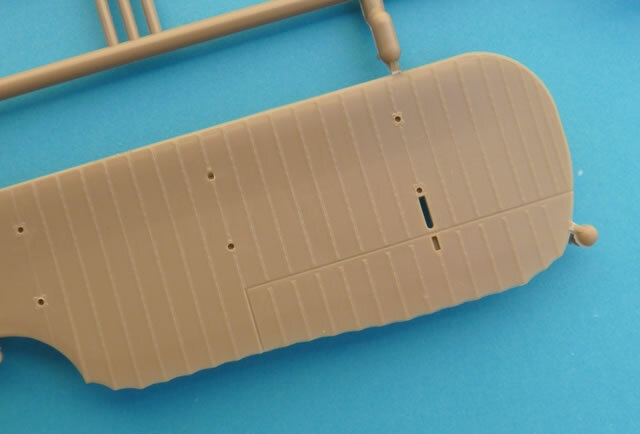 Eduard’s ProfiPACK kits guarantee the modeller a level of detail that surpasses “standard” releases. With finely moulded plastic parts, coloured photo-etched fret and a generous decal sheet, an outstanding replica of the original is within easy reach of any builder with a modicum of experience. Care should still be exercised during assembly however, and regular dry-fitting is recommended. 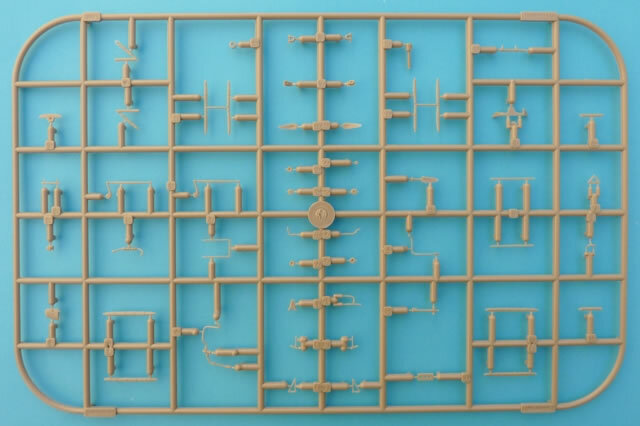 The wide variety of colours and markings will ensure that WWI modellers will want more than a couple of this legendary scout in their collection.